Read a wonderful article here about twitter conversations and thought you would love it. Twitter can sometimes seem like an endless universe where messages and conversations burn brightly for a short while and then float off into oblivion. Leave it to the Pew Research Center to find meaning in the madness. 1. Divided: This conversation type references different groups of Twitter users who discuss polarizing topics. Users in one group rarely talk with users in an opposing group. Think politics. 2. Unified: Unified conversations occur within close communities, like those formed around hobbies, professional organizations or conference attendees. Users connect with each other to swap information and ideas. 3. Fragmented: The conversations around products and celebrities are fragmented-the people who follow these topics are large and very different from each other. 4. 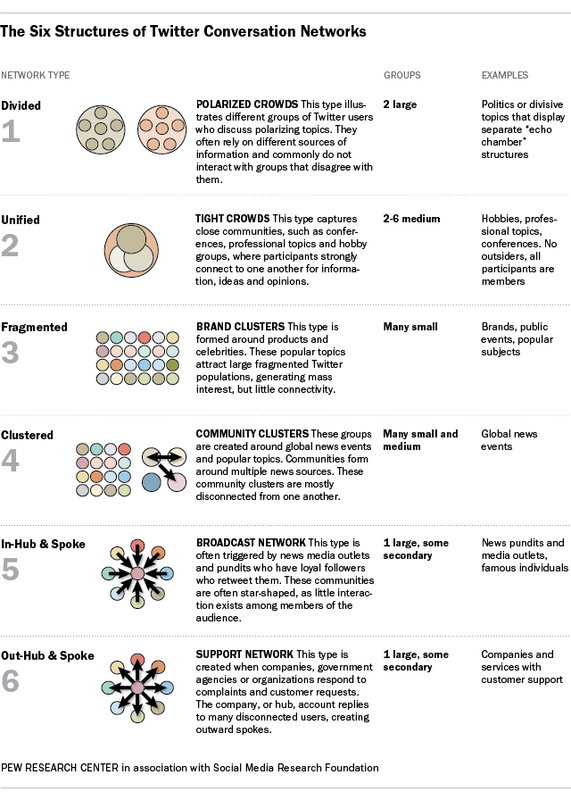 Clustered: Global news events set off many small and medium-sized clusters of conversations. These clusters usually form around various news sources, and don't interact with other clusters. 5. In-hub and spoke: News outlets and pundits often spark these conversations. The discussions largely consist of users retweeting the news outlet or pundit. 6. Out-hub and spoke: These conversations happen when organizations use their Twitter profiles for customer service issues. The organization (hub) sends messages to disconnected users (spokes). Are you raising a spoilt brat? What is the world eating?